In the opening of The Last Castle, the viewer is given the definition of what a castle is, and how a prison can be very much like one, only that a castle is meant to keep people out, and a prison is meant to keep people in. This is one of the ideas featured in the film, and sadly, one of the few that actually gets its point across. The story opens with Lt. General Eugene Irwin (Robert Redford), a renowned military tactician who has been court-martialed, and sentenced to ten years in a maximum-security military prison. Running the prison with an iron fist is Colonel Winter (James Gandolfini), a precise, organized man with a large collection of military memorabilia and a deep admiration for Irwin. After a cordial introduction with the Colonel, Irwin learns from the prisoners that the warden is a sadist who has either ordered or allowed the murders of several inmates. The prisoners look for him to lead an insurrection against Winter. Feeling that he no longer has a war to fight, Irwin declines, but soon discovers that the warden's unorthodox methods of discipline (such as leaving a prisoner standing in the rain, saluting, for hours) go against the basic training of a soldier, angering the former General. He immediately requests Winter's resignation. Winter, amused, responds “Then I guess I better go pack,” and refuses to leave. 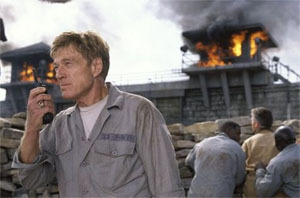 Irwin decides that in order for the Colonel to be stripped of his authority as warden, he must lose control of his prison. With that in mind, he organizes a takeover. What makes The Last Castle so engrossing is the combative power between the two leads. Redford gives a commanding performance that takes us back to the days of his simpler, less ambitious roles in films like Brubaker, an earlier prison film in which he starred. Though well into his sixties, he still has a powerful physical presence. As his adversary, Gandolfini plays his role with a strong hold that, surprisingly, never once brings his character on “The Sopranos” to mind. But there are flaws. His character is under-drawn. We are never given any real explanation for his personality, and in the long run, who he is at the beginning, is who he is at the end. He remains placid where he should be made indignant. Restrained, where he should be broken down, and it’s never made clear why. Though the leads excel, Delroy Lindo (as the Colonel's superior) and Robin Wright Penn in supporting roles are wasted. Lindo plays an intricate part in the storyline, but only in a small portion of the film. Even more shortchanged is the uncredited Penn (as General Irwin's estranged daughter), featured in one scene, in a subplot about Irwin's wish to be close to his grandson. The promising idea is raised, only to be dropped, and never to reappear. The story builds nicely to the exciting climactic takeover. In the last half hour, the operation becomes an elaborate chess game between Winter and Irwin. One where high-ranking officers are the knights, inmates are the pawns, and the prison is the board. As the game ensues, the explosive battle draws a parallel between a war of weapons and the battle for dignity. The film has some important messages to be sure, but only some—that of men willing to follow a righteous leader into danger, despite being fully aware of risks ahead—are well delivered. But the fact that these men are hardened criminals, even though they are soldiers who have fought valiantly in the past, makes rooting for them somewhat difficult. 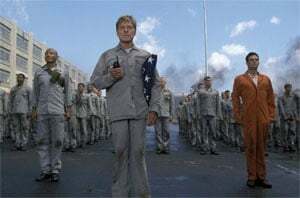 Other themes, such as what it is to be a good soldier, are casually thrown into the story, as if Director Rod Lurie was experimenting with cynicism, to see what viewers might accept as plausible and what they would dismiss as contrived. The Last Castle should have been a gem. It is appropriately low-key and features a strong ensemble, but it could have been more powerful, and needed a better defined point of view. Recent prison movies have either fallen into the category of being exceedingly sappy or quietly poignant. Here the sap is only occasional, but the poignancy is muted. The effect is as mixed as the message itself.